I'm back everyone, and I've still got more ideas to work with. I haven't been doing much in ROM Hacking since I'm working on another project, I might post about it here soon. 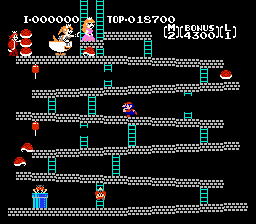 For now, I'm working on another Super Crown/Bowsette related ROM Hack, this one being on the NES version of Donkey Kong. I plan on making 2 versions, the original NES port and the 2010 European ROM release with all 4 levels. Right now I'm just working on getting some ideas going for the enemies that'll be involved and the look of the game. I've already edited the Mario sprites and replaced Pauline with Peach. My main goal is to make a Bowsette (currently working) and a Boosette version starring Luigi. Thought I was finished? I'm not done yet...I mentioned earlier that I've got some more ROM Hacks I wanted to work on. This is based on the Donkey Kong ROM Hack from the NES. Which, I should also note, will include a version that contains all 4 levels and the climbing animation to the next area. Each of the levels will reference the earlier Mario games from 1, lost levels, 3, SMW, and SM64. Here's a preview to the Bowsette variant I've been progressing on. Once I finish, I plan on a Boosette version where it's all ghosts and you play as Luigi. Given how things are, probably will have it ready by around April. Looking good, it's always great to see more Donkey Kong hacks, and Bowsette just makes it even better. That looks cool, I'm glad you're picking up the DK game that has the pie factory level. I'll include a version that is also the original NES (3 levels) too. At this point, I should mention that I've got most of them done. There WILL be a Boosette version where you play as Luigi. I just need to change up a few sprites in 75M and minor code stuff. Speaking of which...would you prefer if it had the "score save" to it as well? Or not really? You can click the link to vote if you prefer not to reply. Sure add the Score Save, I'm down with that. Here it is everyone, another well handled ROM Hack. 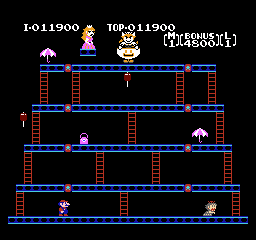 This one of the original Donkey Kong game featuring Bowsette or Boosette! 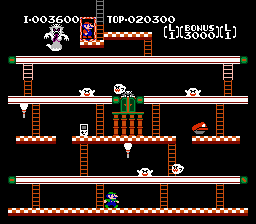 Play either 3 (NES) or all 4 (OE) levels. All versions uses a Score Save feature. Princess Peach has been kidnapped and it’s up to Mario to stop Bowsette by climbing to the top of her castle! Queen Boosette has trapped Mario in a painting, now Luigi must brave his way through the ghost filled mansion to rescue his brother and lock the ghost back into a painting. Special thanks to Morgan Johansson for Score Save patch.